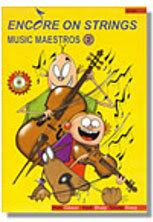 This is the first book in a series which has been specifically developed to meet the needs of beginner string students. The Encore on Strings, Music Maestros Series is extremely popular throughout Australia. The first book is available for violin, viola, cello and double bass. It’s a well paced resource that is ideal for both private and group tuition. The book comes with an excellent CD which provides an aural model at practice and performance tempi, enhances beat and pitch awareness and motivates and energizes students. Covers a range of musical genres and styles from classical to rock and reggae. Includes Fiddle Zips which help establish fundamental technique and Repertoire Pieces for performance. Each piece features a particular teaching point such as introducing a new note, a new skill or perhaps reinforcing previous elements within a new context. To assist both the teacher and the student, the main teaching point relevant to each piece appears underneath its title. Other teaching points will become self evident as the pieces become more familiar. Accompaniment book is available. This provides acoustic possibilities for class and performance. Piano, violin, viola and cello lines are included for flexible ensemble settings. This is the second book in the series and follows directly on from the first Maestros book. The second book is also available for violin, viola, cello or double bass. It’s ideal for both private and group tuition. The book comes with an excellent CD which provides an aural model, enhances beat and pitch awareness and motivates students. The repertoire covers a range of musical genres and styles from classical to folk and swing. The book Includes Fiddle Zips and Daily Warm-Ups which help students establish fundamental technique. Repertoire Pieces are ideal for solo or unison group performance. Many of the pieces have ensemble outcomes when linked with Music House ensemble pieces, or played with lines from the accompaniment book. Accompaniment book is available. This provides acoustic options for class and performance. Piano, violin, viola and cello parts are included and enable flexible ensemble possibilities. 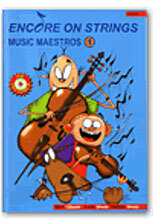 Click Here to order Encore on Strings Music Maestros books directly form Accent Publishing.